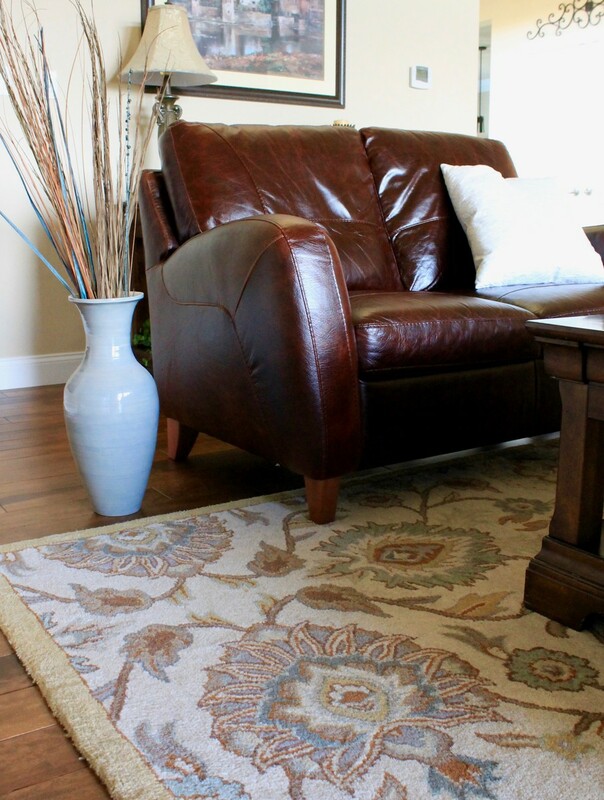 Learn how to choose the perfect placement, size, and color for an area rug with this fail-proof guide. Whether it’s a newly-built home or a facelift on the current one, the living room is usually the first room on the list when it comes to creating an interior design plan. This particular room is where the entertainment and conversation happens, so it has to look warm and inviting while providing enough seating for watching movies, playing games, and chatting during holiday gatherings. 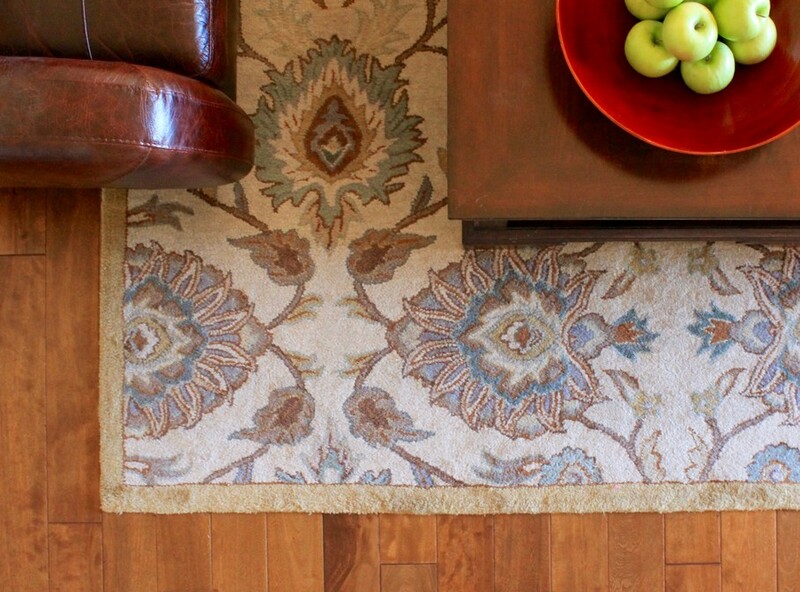 When starting on a design plan and searching for décor, most homeowners want to know how to choose an area rug size for the living room, especially if they have hardwood floors. Area rug placement in the living room is usually fairly straightforward in terms of its location, as placing it in the center of the room provides a foundation for the furniture arrangement. When setting up a living room that has standard furniture set – a coffee table, a couch, a loveseat, and one or two chairs, its best to arrange furniture around the TV and fireplace (if you have one), since those are the focal points of the room. Once you come up with a design that works with your focal points, you’ll need to determine the relationship between the furniture and the area rug. 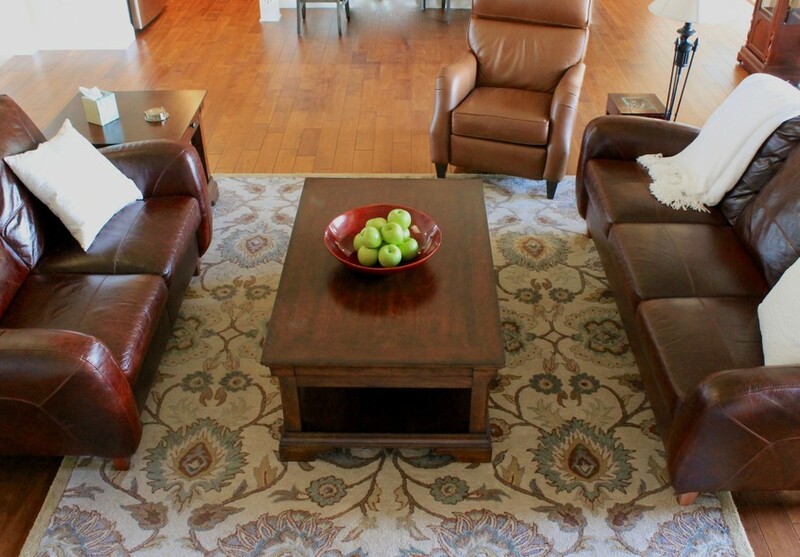 Put the area rug completely under the couch, loveseat, and chairs. Place it partially under the couches and chairs. Put it under the coffee table only with none of the couches or chairs touching it. In this particular living room, there’s room to do it any of those three ways. However, to be able to see the beautiful hardwood floors, it’s best to go with the second option, which is to only have the front legs of the couches and chair overlapping onto the rug. After you make a decision about rug placement in relation to your furniture, you’ll need to determine which size area rug is best for your room. 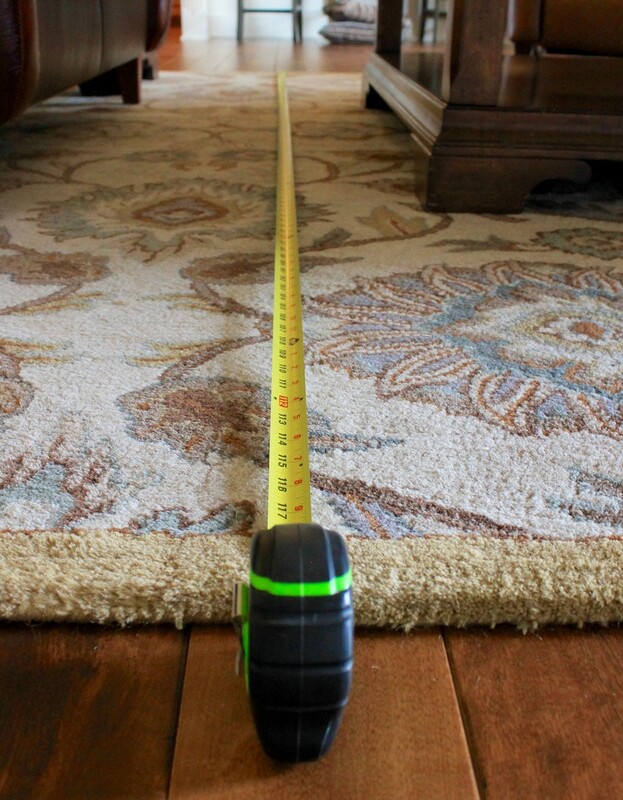 First, you have to take a look at the size of the room itself to determine what size area rug will fit best. Since this a large, open-concept room that measures 16-by-18 feet, it’s best to have a rug that fills up the space enough without covering too much of the hardwood floors. 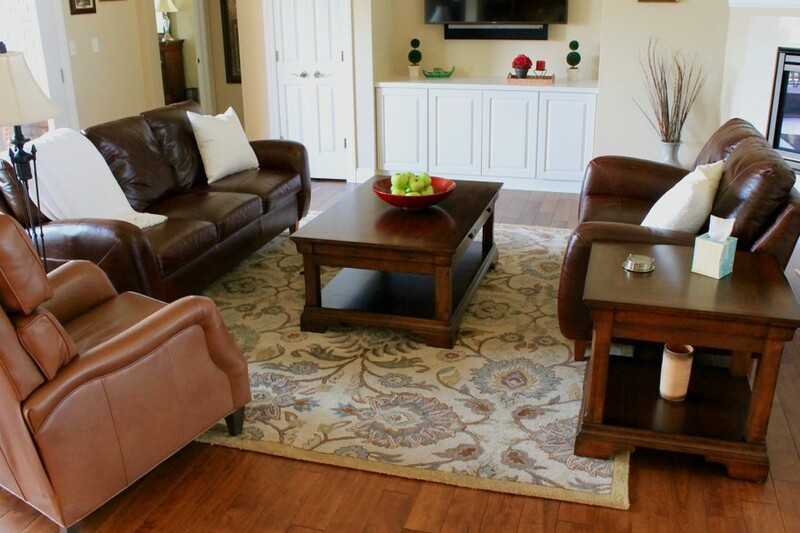 Standard area rugs sizes range from 4-by-6 feet to 12-by-15 feet, and most living room area rugs usually fall somewhere in the middle (either 5-by-8 feet or 8-by-10 feet). Since this particular room design plan calls for the front legs of the couches and chair to be on the rug, an 8-by-10-foot area rug will provide the perfect amount of coverage. It adds visual interest in the middle of the room without taking away from the striking hardwood flooring and allows the furniture to create borders on either side of the room, with plenty of space to walk behind and in front of each couch. Once you’ve determined the size and placement of your area rug that will best suit your room, it’s time to choose a pattern and color scheme that complements your home’s design style, as well as the room’s specific décor. Since this is an earth tone living room, an area rug with rich tans and browns, sage green, and cerulean blue will bring this room to life and add a beautiful contrast against the dark hardwood floors. The walls in this room are very neutral, which allows the freedom to implement an intricate pattern to break up the monotony of the solid-colored furniture, walls, and flooring. Not only will the colors and pattern bring much-needed visual interest to the living area, but they’ll also bring out the colors of the decorative items in the room such as vases, throw pillows, and paintings. 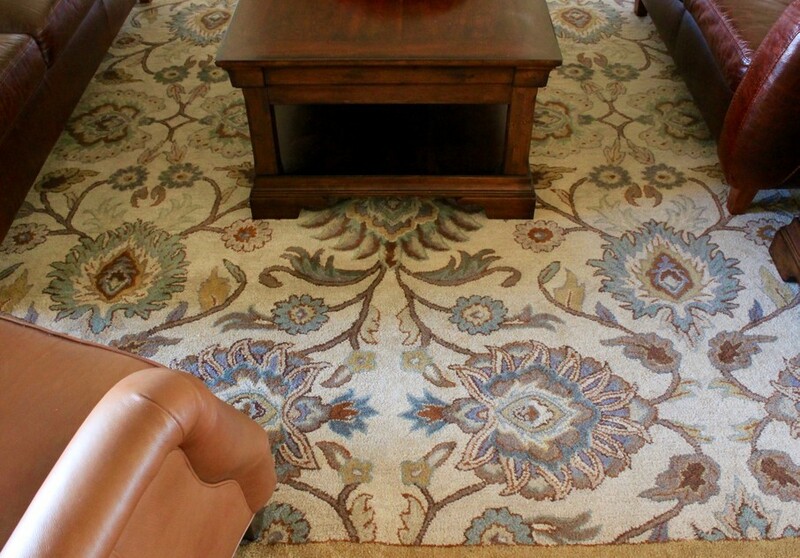 It’s amazing what one rug can do transform a room! An area rug can become a talk-of-the-party statement piece in and of itself if it’s implemented correctly, and the these three tips will help you do just that. So grab a sheet of paper, a pencil, and a measuring tape. Your rug-centric living room design is ready to come to life!